This dataset contains the ichthyoplankton data from three National Reference Stations on the east coast of Australia (North Stradbroke Island, Port Hacking, and Maria Island), and comparable historical data from eight ichthyoplankton surveys that were used to provide a longer term context: RV Sprightly (1983) RV Challenger (1989-1991) RV Franklin (1994) RV Franklin (1997-1998) RV Franklin (1998-1999) RV Southern Surveyor (2004) RV Investigator (2015) FRV Kapala (1989-1993) Refer to the published report which had the following goals: - To evaluate the value of long-term monitoring of ichthyoplankton at selected locations in the Integrated Marine Observing System (IMOS) National Reference Station (NRS) network, - To identify the potential of this monitoring for providing fishery-independent information relevant for marine fishes and their management. Note - Currently only the data from the IMOS NRS Stations have been made available. This dataset comprises the measurement of Secchi Depth and Total suspended solids (inorganic and organic components) analysed from samples collected as part of the Integrated Marine Observing Systems (IMOS) National Mooring Network -National Reference Station (NRS) field sampling. Nine Sites are included in the IMOS NRS field sampling stations. Maria Island (TAS), Kangaroo Island (SA), Esperance (WA), Rottnest Island (WA), Ningaloo (WA), Darwin (NT), Yongala (QLD), North Stradbroke Island (QLD) and Port Hacking 100 (NSW). Sampling at these sites is conducted by several members of IMOS NRS Biogeochemical project. Sampling at the sites began between 29/9/2008 and 8/11/2010 and is currently ongoing for 7 sites. 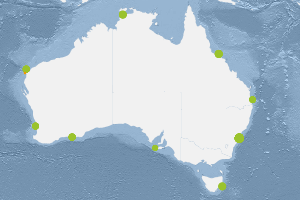 Sampling ceased at Ningaloo and Esperance (WA) sites in Aug/Sept 2013. Sampling is conducted monthly (Esperance and Ningaloo were 3 monthly) off small vessels. Depths sampled range from surface to 105 metres depending on the site. Depths are usually sampled at 10 metre intervals. Details including information on station locations, depths sampled and sample types collected are shown in the PDF link below extracted from the IMOS NRS NATIONAL REFERENCE STATIONS BIOGEOCHEMICAL OPERATIONS - A PRACTICAL HANDBOOK, Version 2.2 July 2012. A link to the full handbook is also provided which includes full details of the sampling regime and analyses. Historical data collected as part of CSIRO Coastal Monitoring program is available for three of the National Reference Station sites: Maria Island Coastal Station Data 1944-2008, Port Hacking 100m Coastal Station Data 1953-2010 and Rottnest Island Coastal Station Data 1951-2009. The links to the metadata and access for these data is provided below. Data storage and access is planned to be interoperable with other national and international programs through the IMOS Infrastructure. Station metadata can be found through this resource. Data is freely available through the AODN portal: https://portal.aodn.org.au.